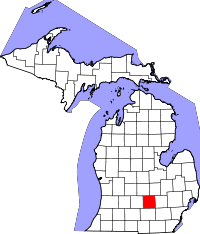 Ingham County is a county located in the U.S. state of Michigan. As of the 2010 census, the population was 280,895. The county seat is Mason. Lansing, the state capital of Michigan, is located within the county, and is the only state capital located in a county that is not also its seat of government. The county is home to Michigan State University, Lansing Community College, and the Class A minor league baseball team Lansing Lugnuts. Ingham County is included in the Lansing-East Lansing, MI Metropolitan Statistical Area. It is considered to be a part of Mid Michigan. The county was named for Samuel D. Ingham, the U.S. Secretary of the Treasury under President Andrew Jackson, making Ingham one of Michigan's so-called Cabinet counties. According to the U.S. Census Bureau, the county has a total area of 561 square miles (1,450 km2), of which 556 square miles (1,440 km2) is land and 4.6 square miles (12 km2) (0.8%) is water. The county consists of gently rolling hills with an elevation ranging between 800 and 1,000 feet above sea level. The highest point in the county is the top of Teaspoon Hill rising to a height of 1,056 feet above sea level 1.5 miles north of Leslie. According to the 2007-2010 American Community Survey 22.8% were of German, 13.2% Irish, 12.5% English and 5.6% Polish ancestry. 88.2% spoke only English, while 3.9% spoke Asian languages and 3.8% Spanish at home. As of the 2000 Census, there were 108,593 households out of which 29.80% had children under the age of 18 living with them, 43.00% were married couples living together, 12.10% had a female householder with no husband present, and 41.30% were non-families. 30.20% of all households were made up of individuals and 7.70% had someone living alone who was 65 years of age or older. The average household size was 2.42 and the average family size was 3.04. In the county, the population was spread out with 23.40% under the age of 18, 18.50% from 18 to 24, 28.60% from 25 to 44, 20.10% from 45 to 64, and 9.40% who were 65 years of age or older. The median age was 30 years. For every 100 females, there were 93.30 males. For every 100 females age 18 and over, there were 90.10 males. The county government operates the jail, maintains rural roads, operates the major local courts, keeps files of deeds and mortgages, maintains vital records, administers public health regulations, and participates with the state in the provision of welfare and other social services. The 14-member county board of commissioners controls the budget, but has only limited authority to make laws or ordinances due to Michigan's large devolution of local power to cities, villages, and townships. The county board of commissioners also hires a county administrator/controller who serves as the chief fiscal and administrative officer of the county. ^ a b c d "Bibliography on Ingham County". Clarke Historical Library, Central Michigan University. Retrieved January 19, 2013. ^ a b "State & County QuickFacts". United States Census Bureau. Retrieved April 7, 2016. ^ "2010 Census Gazetteer Files". United States Census Bureau. August 22, 2012. Archived from the original on November 13, 2013. Retrieved September 25, 2014. ^ "Hiking Trails, Mountain Bike Trails & Trail Maps - Trails.com". mountainzone.com. ^ "U.S. Decennial Census". United States Census Bureau. Archived from the original on May 12, 2015. Retrieved September 25, 2014. ^ "Population of Counties by Decennial Census: 1900 to 1990". United States Census Bureau. Retrieved September 25, 2014. ^ "Census 2000 PHC-T-4. Ranking Tables for Counties: 1990 and 2000" (PDF). United States Census Bureau. Retrieved September 25, 2014. "Bibliography on Ingham County". Clarke Historical Library, Central Michigan University. Retrieved January 19, 2013.